A very common floating species of still ponds, lake margins, canals and river margins. 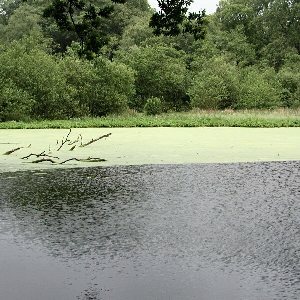 It consists of tiny, circular plates of green tissue, noticeably smaller than either gibbous duckweed (Lemna gibba) or greater duckweed (Spirodela polyrhiza), and with a single root hanging down into the water. On still waters it can form a complete cover over the surface so that a pond or canal can be completely green and "solid" in appearance. It is the commonest and most widely spread species of all the floating duckweeds. All names: Lemna minor L.